Working on the CQJP 2015 blocks once again! This is "October's" block. The further this project goes, the harder the blocks get; trying to balance with the previous blocks and not repeating seam treatments/motifs. Before starting on this one, I had laid out all the blocks together and looked at block orientation and rick-rack placement of the previous blocks and aimed to have the last 3 blocks blend in well, and to have an even mix of orientation/color in the overall piece. It was helpful to know where the top was going to be on this block! As always, I added the rick-rack first and then followed with the curvy herringbone seam above it. I don't often mark seams, but I found it very helpful with the curves and for getting the herringbones placed evenly on this seam. In one corner I added this flowery treatment. It's one of the earliest seams that I copied into my book of seams. 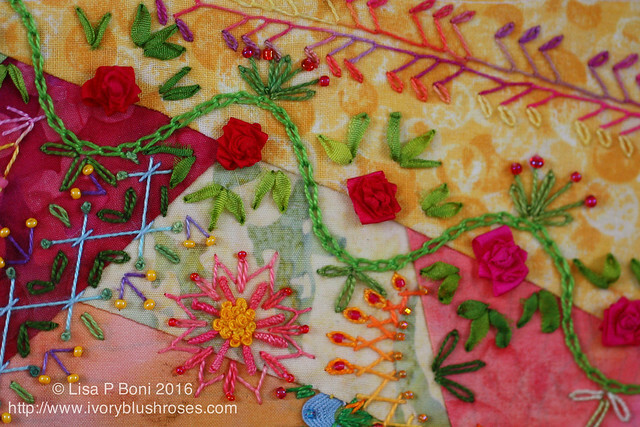 Next I did this curvy chain stitch and added Fargo Roses with some variegated silk ribbon. I also added a floral motif on a short seam. In the blank area on the yellow block, I stitched a double slanted buttonhole stitch with lazy daisies in a nice variegated thread. 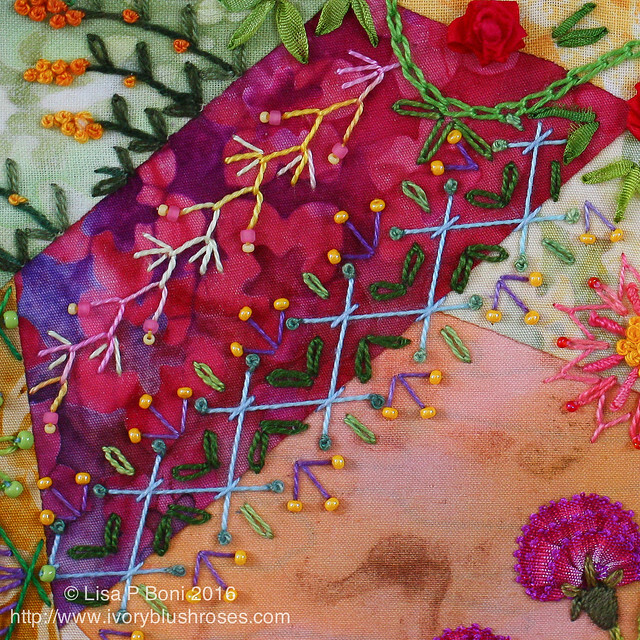 On another small corner, I couched some chenille down and added the larger lazy daisy/fly stitch motif. I debated filling it in somewhat, but decided that I liked it the way it was. 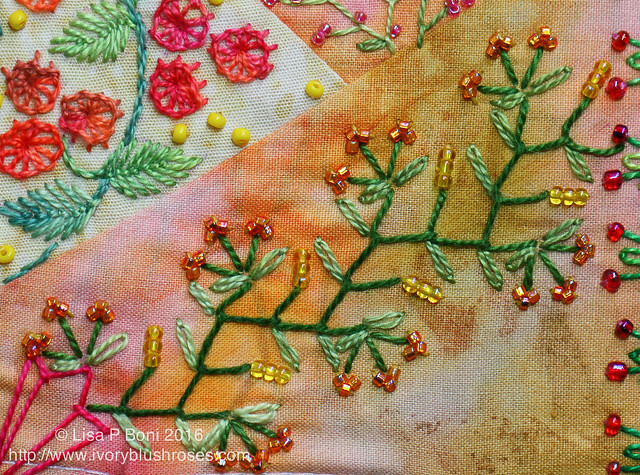 On the gold patch, I added a combination seam of herringbone and buttonhole stitch. I thought it looked like baskets, so I added flowers to it! There was an empty space near the curvy herringbone seam that needed filling. I stitched a curvy vine in back stitch in a light green. Once the rest of the block was finished, it just got lost. At first I thought that adding beads to the seam would help, but I didn't like it, so took them out. Then I went back with a single strand of darker green embroidery floss and shadowed each stitch with it. It made the whole thing much more vivid and helped to balance the block! It's one of my favorite things on this block! For the center motif, I wanted to try something different with the little variegated Mokuba trim. I'd seen carnations done with similar ribbon and so I gave it a try. Pretty happy with how they turned out! 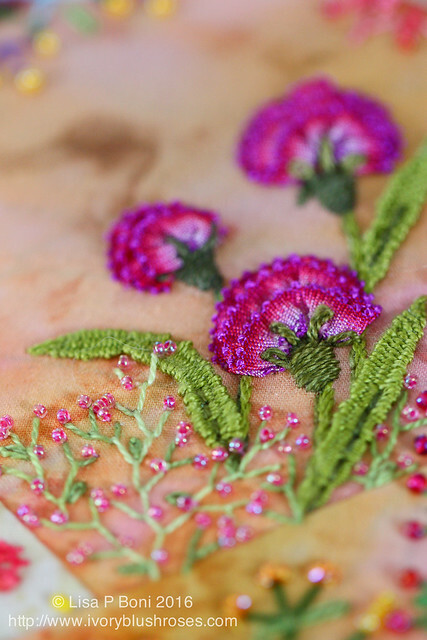 A little pink babies breath finishes off the motif! I've done a lot of herringbone seams on other work of mine and have collected so many variation. 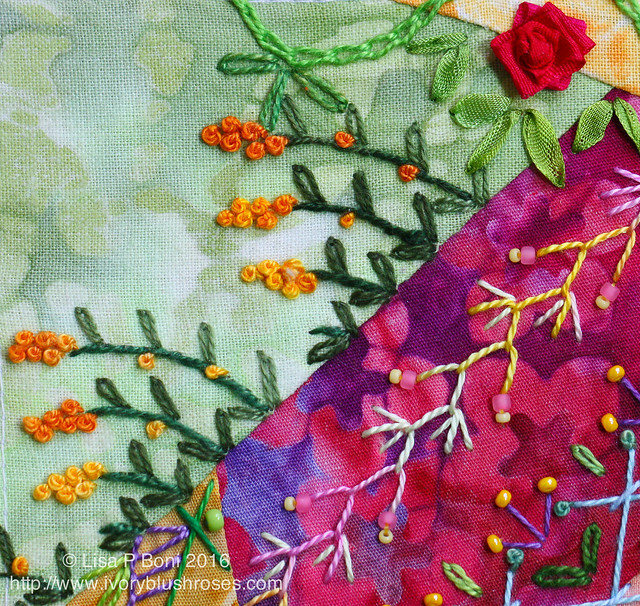 It's such a fun stitch to embellish! A little feather stitched seam helps fill in the rest of the patch. With two empty patches left to fill on the block, I wasn't sure what to try. Sometimes sleeping on something overnight makes all the difference! 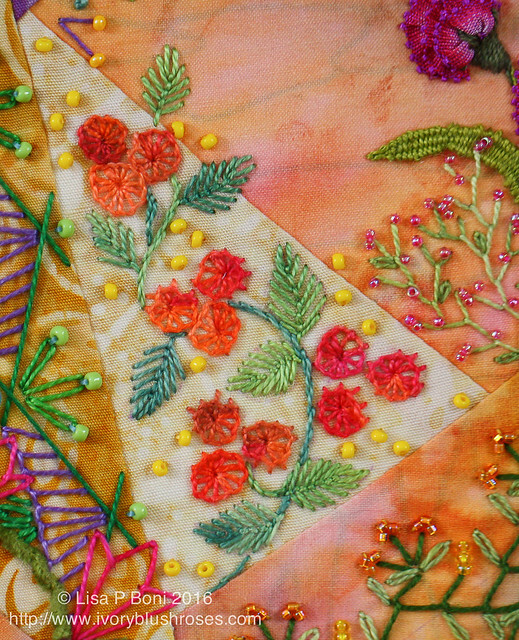 I woke with several ideas and decided on orange button wheel flowers and fly stitched leaves to fill the patch. 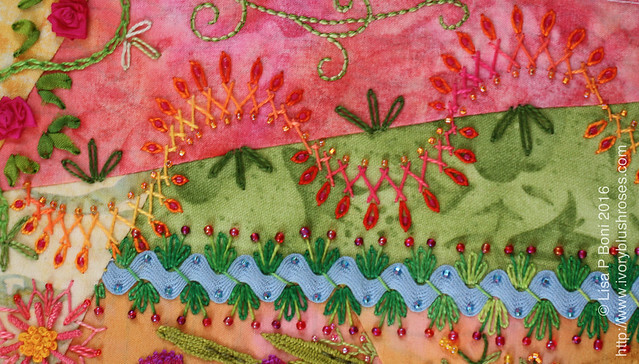 The last seam stitched was another feather stitch variation. 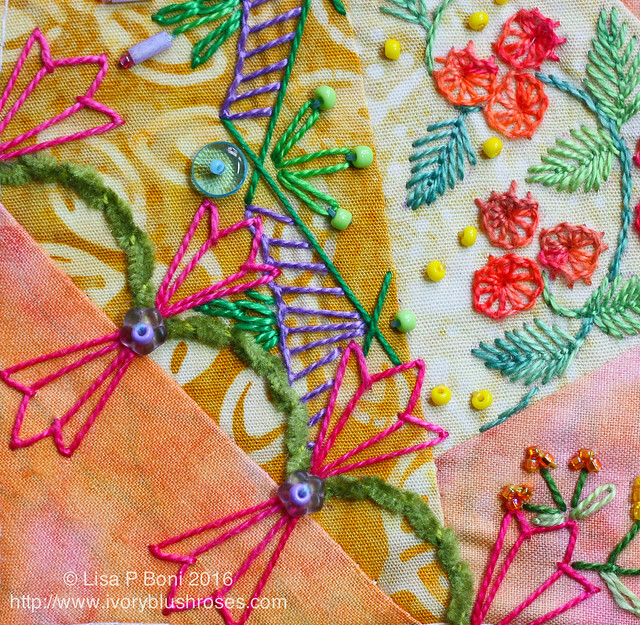 Feather stitch remains my all time favorite stitch and most of the CQJP 2015 blocks have at least a couple of feather stitch seams on them! Definitely loving the little ribbon carnations! So glad to have this block done. Two more to go and then it's time to put this big project together! Can't wait! I've noticed the kitties sitting in the dining room window quite a bit lately. Today, I discovered the reason why! Where the squirrels knock the seed out of the bird feeder that they don't like, the little mice have moved in and are quite happy with the bountiful offerings! 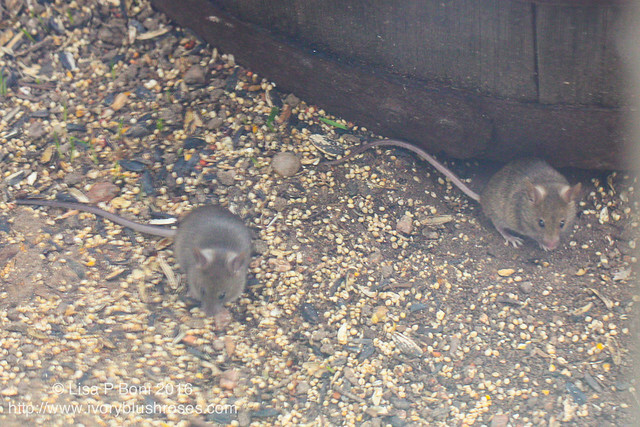 I suspect that they have a very safe home underneath the large barrel that I plant flowers in and there must be quite the array of mouse roadways underneath the ground cloth as I watched these and their buddies scampering off quickly once they realized I was watching! I counted at least 4, and I've always figured that when you see one mouse, there are at least half a dozen others that you don't see. They are cute, but I think it's time to get the traps out lest they start finding their way inside. . Absolutely ❤ it . . .
Lisa, your stitching boggles my mind. You are so precise, and the results are always fabulous. Your work is inspirational to me. If I practice for the rest of my life, I will never get as good . . . Your work will be an inspiration to me. It is quite wonderful. Re: the mice. Please, there's no need to kill these creatures. Simply keep indoor only cats, and no mice will ever enter your home. All without killing, and you'll be giving the cats a safe, warm home. They in turn give such joy and pleasure. This block is just spectacular. The carnations are beautiful. The blue rickrack is just the right colour and everything balances so very well. I feel as though going back to more painting has influenced your colour choices and placement. Just another note on finishing - use a dark green ribbon instead of the black one to go back to the partarre idea. The green will not look as stark as the black. Your stitching is beautiful and very professional. It really is wonderful to see such care taken in creating the blocks. Just spectacular! As always, I am impressed by all you beautiful stitching. This piece is amazing and I 'love' the carnations. Hope you get the mice population thinned out. Once again, Lisa, I love the insight into your design process. I'm particularly taken with the carnation in this block--so lovely. I know that you have two months to go, but what next? I've seen the choices for sashing, but I mean beyond that. When you have it all put together, what will you do with it? Hi, Lisa! Another wonderful block! I love it all but the Mokuba carnations are just spectacular! I'm so happy to see such a great and original idea for using one of my very favorite ribbons. Thank you once again for all the inspiration you provide! C'est toujours aussi beau, magnifique, je suis émerveillée, bravo ! I am just starting out in CQ and your work is what I aspire to. 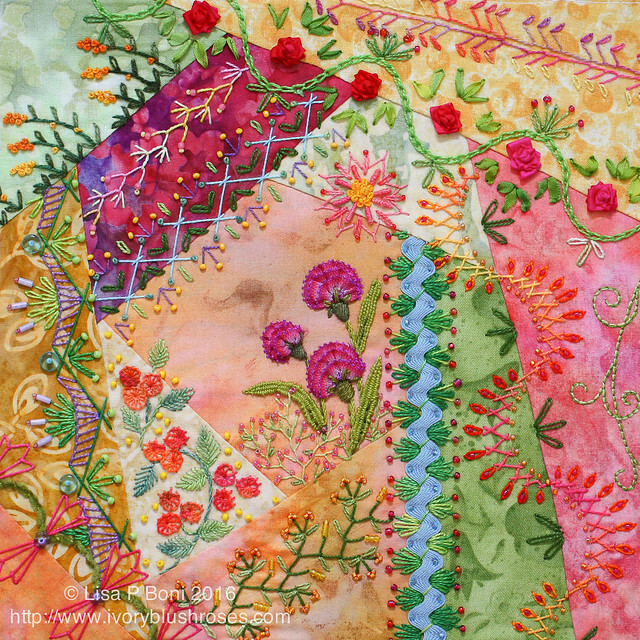 Your blocks are full without being cluttered and it seems that every seam is a delightful surprise. Your work amazes and inspires me! Thank you. As cute as the little rodents are they can be a nuisance and multiply like you can't believe. Better away from the house. I have overly friendly squirrels and I love them but I don't encourage them:( Love all your work and was unable to comment on your Painting blog but I loved the chickadee, warmed my soul. Lisa can you please tell me how you made the leaves for your carnations? I really like them as well as the flowers and love the block! The word that immediately came to mind was 'juicy' - these blocks remind me of sherbet and lemonade. I really love the basket seam - I drew it into my inspiration book and might use it in my next project (or at least a variation of it). 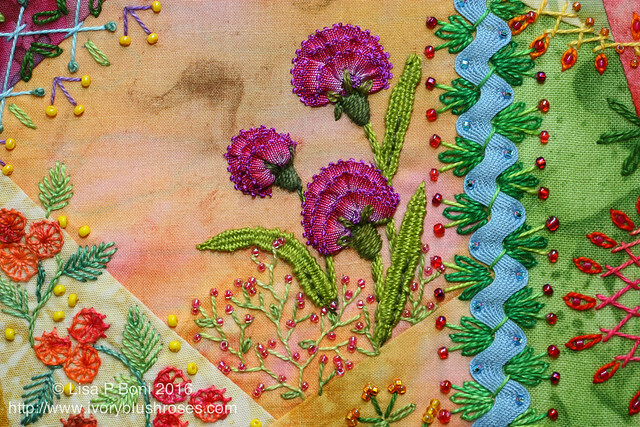 Lisa, your stitching always blows me away. Beautiful, beautiful work! This popped up in my feed this morning and I said to myself 'These colors are so lush! '..I love the blue rickrack - looks kinda like a river with bull-rushes. Well done...its a beautiful block..